Tower Products, Inc., the leading manufacturer of environmentally sensitive pressroom chemistry for the offset and flexographic printing industry, has released a new, low VOC UV flexographic cleaning product, SmartFlex Low VOC UV Cleaner. SmartFlex Low VOC UV Cleaner is specifically targeted at markets where extremely low VOC limits are enforced like Southern and Northern California. The VOC content of this product is under 100 grams per liter making it compliant with both Rule 1171 and By Area Rule 20. This is an outstanding technology for cleaning UV flexographic inks. Its’ low odor and effective formula rapidly cleans the UV flexographic ink from plates and machinery. SmartFlex Low VOC UV Cleaner will not swell photopolymer printing plates and can be applied by hand or used in an automatic plate cleaning unit. 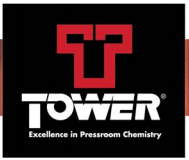 For more information, contact Tower Products at info@towerproducts.com or log on to www.towerflexo.com.